Metrosideros tomentosa also the New Zealand Christmas Tree-Metrosideros Tomentosa. Attractive and very hardy medium sized evergreen tree flowering in late autumn, spring and summer, with bright scarlet color pom-pom flowers. It is in the myrtle family, mrytaceae. 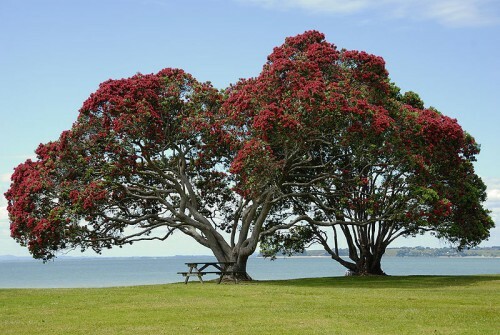 The Pohutukawa is one of 12 Metrosideros types native to New Zealand. Renowned for its vibrant color and its ability to survive even perched on rocky, precarious cliffs, it has found an important place in New Zealand's culture, both of the European settlers and Maori, being venerated for spirituality, strength and beauty, and considered one of the "chiefly trees" Likes a sunny aspect in well drained soil. Good for use in coastal areas. Grows to a height of approx 4-5 meter, prefers full sun, wind tolerant.